A risky turnaround plan is starting to pay off, but now comes the hard part. 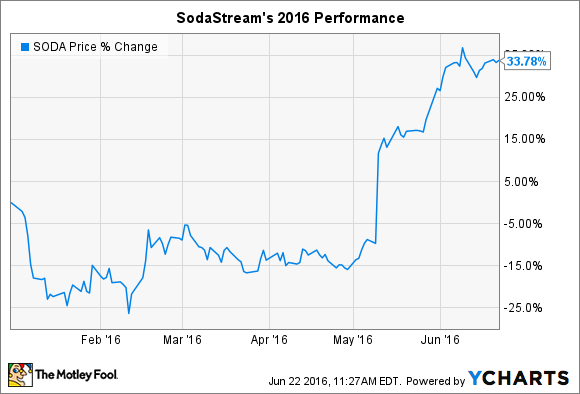 What: At home carbonated beverage machine maker SodaStream (NASDAQ:SODA) is having a great year. Shares are up by more than 30% in 2016, according to data provided by S&P Global Market Intelligence. SODA data by YCharts, Data as of Jun. 22. While impressive, the rally hasn't been sharp enough to make long-term shareholders whole again: The stock is down 7% over the past 12 months and has slumped 70% below its all-time high set in 2011. So what: Investors are beginning to believe in the company's turnaround plan that revolves around a brand pivot away from soda and toward a health-centered, sparkling water focus. CEO Daniel Birnbaum and his team are betting that the shift will help SodaStream begin acquiring new customers at a healthy pace again. Executives are also slicing costs through a reorganization aimed at raising profitability. The financial impacts of these moves are finally starting to show up in the company's earnings results. In May, SodaStream revealed that it had ended its revenue slide in the key U.S. market. And for the second straight quarter, cash flow was positive. Now what: SodaStream's business hasn't totally recovered. Sales are expected to clock in at $440 million in 2016, which is better than last year's $413 million but far below 2013's $600 million haul. To get back to that high-water mark, Birnbaum and his team need to arrive at a marketing message that resonates with U.S. consumers. Shareholders will know if that's happening by watching sales growth. That figure was flat last quarter, marking an improvement over the double-digit slump that SodaStream has endured in the last year. Yet the sparkling water industry is seeing healthy growth. So, if management is right that their new focus can capitalize on that trend, investors should expect to see solid revenue gains in the coming quarters.